Back massage is ideal occasion to get rid of conditions connected with sedentary lifestyle. If you deal with aches of forearms, back or neck, this kind of treatment is perfect for you. This massage' d release you from tensions in muscles and problems in the spine area. It's highly recommended for people dealing with stress on daily basis. In this case masseur' d concentrate on upper parts, which consist of back, forearms and head. This treatment is dedicated for people, who have already experienced thai massage as well as for people, who have never tried it before. Coming to our salons, you can be sure that everything you'd need is on place. Before massage, we'd provide you special thai uniform, similar to popular kimono. Fully- equipped bathroom is waiting for you in case you' d want to take shower before or after massage. The only thing you'd need is time for this kind of pleasure. Years of experience of our masseurs has confirmed that 1-hour version is optimal. Half- hour version is a good option in case you don't have much time and you'd want to achieve peace of mind and body in a short time. Otherwise, if you deal with more serious problems, we'd highly recommend You to try thai massage, which concentrates on whole body. This massage stands out from another due to the combination of relaxing techniques with the ones typical for traditional thai massage. Treatment is carried out in lying position on a specially prepared mat. At the beginning masseur eases tension in back area to prepare it for the other parts of the treatment. Massage concentrates on muscles of back, forearms and neck. It' s done with special thai cosmetics, which help to enhance the results. At the end, when muscles of back are regenerated, masseur pays attention to front of the body- chest, forearms and hands. 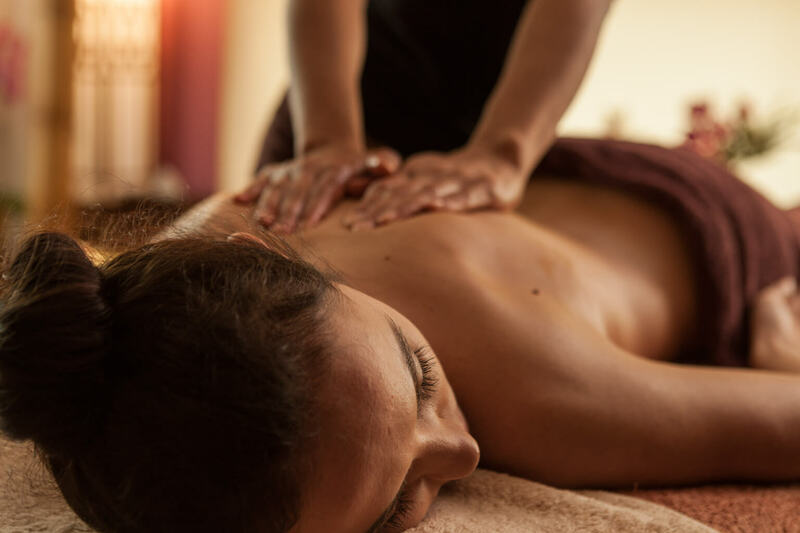 It may seem that it's more than a back massage, but philosophy of thai massage is to treat reasons, not symptoms, and consider body as a whole. Treatment ends up with head massage, which is helpful with migraine and has beneficial influence on concentration. After massage you'd feel relaxed and pain in muscles' d be reduced. Taking into consideration characteristics and aim- relaxation of stress tensions- this kind of massage can be intensive. But it's all supposed to give you relief and relax. For your request, massage can be adjusted to your actual needs. We' d like to encourage you to talk with masseur so that they' d know what you'd want to focus on and what kind of balm 'd be suitable. Treatment is dedicated for people dealing with problems due to sedentary lifestyle. The aim of massage is eliminating chronic and posttraumatic pains in spine. It also helps to reduce tension and pain in forearms and neck areas. We' d highly recommend this treatment people dealing with stress and the ones, who have sedentary lifestyle. It excellently eases tensed back muscles and eliminates headaches. Upper parts treatment mostly concentrates on spine, neck and head. It's done in lying position with special thai balms with menthol and camphor. Masseur uses own hands and elbows to ease tensions, which tends to accumulate in blade and neck area. Back massage is also available in 30-minutes version. It's intensive treatment, but thanks to that it brings relief and relaxation of muscles. Results of treatment are: reducing chronic pain, tensions and stress, eliminating headache.